Welcome to the Moose Pond Association website. In case you don’t know, Moose Pond is located within the towns of Bridgton, Denmark and Sweden, Maine in the Western Maine lakes region. There is an abundance of beautiful lakes in this region with a number of them being infested by non-native invasive aquatic plants. 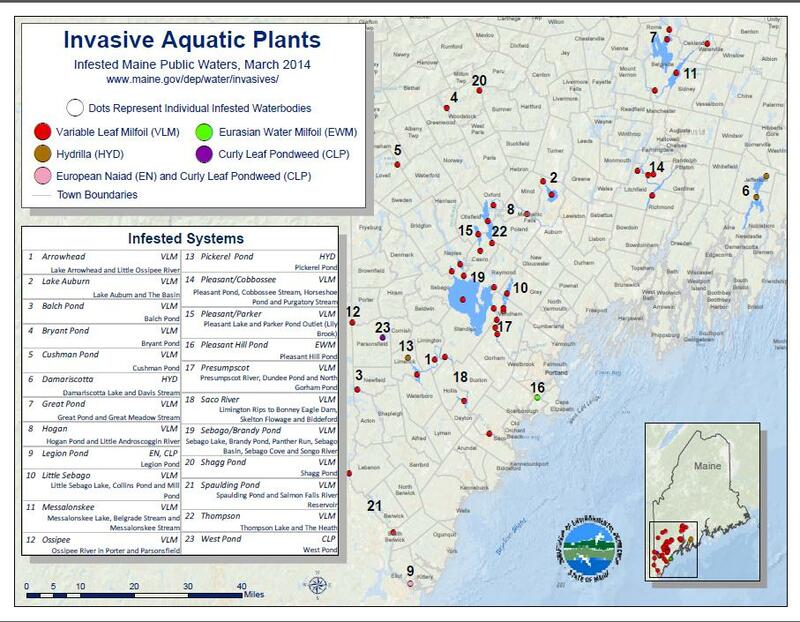 Maine currently has 30 lakes infested with invasive plants. These plants can literally destroy a lake. That is the main reason the Moose Pond Association (MPA) was formed working in partnership with the Lakes Environmental Association (LEA). The primary objective of MPA is the prevention of milfoil in our lake. Non-native milfoil is an invasive plant that spreads quickly, making swimming and boating very difficult. Shore front property values can drop 20 to 40 percent when milfoil invades a lake! There are a number of lakes and streams in our area that have milfoil infestations. It takes only a very small piece caught on the bottom of a boat, the propeller or trailer to infest our lake. Eradication is nearly impossible. Property owners spend more than $100,000 per year just to control the infestation. MPA has additional goals, which can be found on our “About MPA" page. We welcome you to become a member of MPA and help the association meet its goals. Please browse through our other web pages to see details of what the association is doing. Send MPA an email letting us know what you think are the important issues/concerns for Moose Pond and the surrounding environs.